A very close friend once told me, “you WON’T regret going, but you will regret NOT going,” in an effort to motivate me to exercise one day. I’ll come back to this in a bit. We all have regrets. We’re human. There are things we shouldn’t have said and done. There are things we should’ve said and done. Those regrets either haunt us for the rest of our lives or we learn from them to make ourselves better. Take yourself seriously. Accountability – it starts with you. Hold yourself accountable to your actions. If you set a goal, make sure it’s attainable (but not too easy) and achieve that goal. There’s a personal story about this below. “No one can make you feel inferior without your consent.” – Eleanor Roosevelt. Take yourself seriously and keep moving towards your goal. Know that you’re the only one that can change you. You’re the only person that can truly change you. You have to put forth effort and work on the little things first before tackling the big issues. They’re all related. Work on self-improvement because it’s the right thing to do, not because it’s what someone else wants you to do. Experience is experience. Before you dismiss the job that’s “beneath you”, ask yourself, “What experience could I gain from this opportunity?” One of the best decisions I’ve ever made came by chance. I had no intentions of going down the path I did, but I wouldn’t be where I am today without taking that risk. Whether it’s scrubbing the toilets, working customer service, or managing 300 employees, there’s experience to gain. Apply that experience to your dream job. We all have to start somewhere. Here’s my personal story: This year and going forward, I set some pretty lofty personal goals for myself. One area involves constant exercise and training to help me live a healthier, longer life. I want to be on this planet as long as possible. I want to be a Dad, a Granddad, Great-Granddad, even Great-Great (my Great Grandmother achieved this in her lifetime.) This reality hit home for me one day when I had some chest pains (turned out to be nothing) a few years ago. Since then, I’ve done some serious work on myself, losing over 55lbs. My goal is not to be the body-builder or skinniest guy on the planet. I simply want to better me for me and those who love me. My wife, family and friends have been extremely supportive as I continue this journey. The tough, yet attainable goal for January-June 2011: Run a 5K race under 30:00 (my best time to date: 32:00) and log 310 miles running by my 31st birthday in June. So, where am I going with this? Friday, I was sitting in my cube at work when I received an email from a local contact about the May Day 5K in Republic, MO benefitting parks & recreation and the new Veteran’s memorial in the town. You’ll never regret going, but you will regret not going. Those words haunted (and inspired) me. I got up early the next day (Saturday), put my running gear on, loaded my iPod with a playlist to get the blood flowing, and headed to the race site. 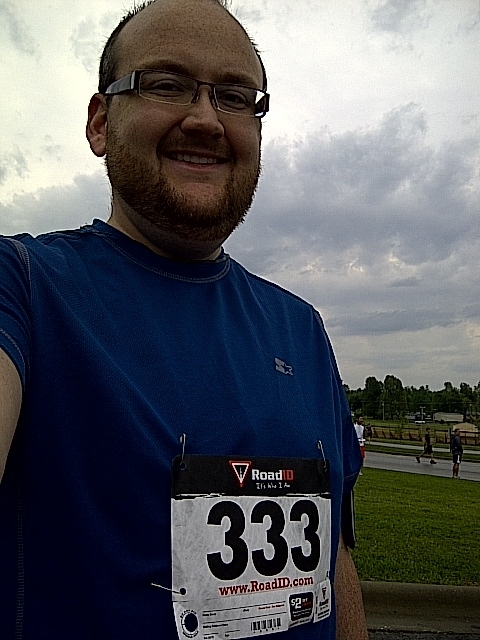 I got my official race number and lined up with 400 other people. I was about to run my first 5K race – no time better than the present! The gun went off and we all started down the course. I remembered the words of friends, “start steady, keep a good pace and kill it during your last half mile.” I did just that. Remember my goal from earlier? 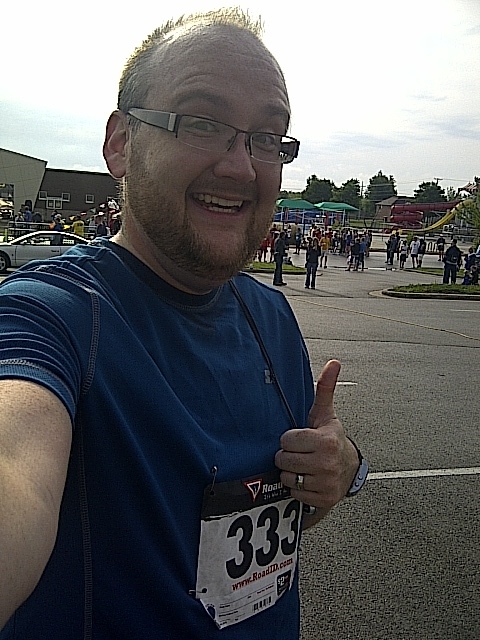 My personal best time to beat was 32:00 for 5K. I crossed the finish line with a time of 28:33! ! This was made official, thanks to the microchip attached to my race number. 400 people raced that day. I finished 89th. Oh yeah, this goal was achieved 7 weeks early. I hope that story inspires you. It doesn’t have to be about running or exercise. Just get out there and learn. Take yourself seriously; know what it takes to change for the better, and experience life. Apply what you learn to your future. Be tenacious. Go for the gold. Thank you for the blog. Accountability to self at times can be hard but like you mentioned it takes one deep thinking session to get on the ball. When it comes to experience many young business people like myself always want to land the dream out of college like If others or myself are Lebron James and Kevin Garnett. The truth is that no one wants to go through hard work and think their nothing because their first job out of college is not the office suite with the 3 week vacation clause. SIFE Nationals really made me think and realize that the small begins is what the CEO’s require and like for the new comer to go about. Thanks for the blog. Thanks for the comment. Glad you liked my post. I’m also glad you took some very positive things away from the SIFE USA National Exposition last week. There’s so much to gain from being involved in such a great organization. Someday, we’ll all be working for you and the other students as the leaders of our country! 🙂 Keep up the great work! Thanks for the comment! I appreciate the kind words. It’s people like you that keep me going – keep it up!